It's Valentine's Day and the world is a-buzz with love. Whether your sweet story invokes valentines past, precious childhood cards, or tender moments with your honey, you need Bee Mine. 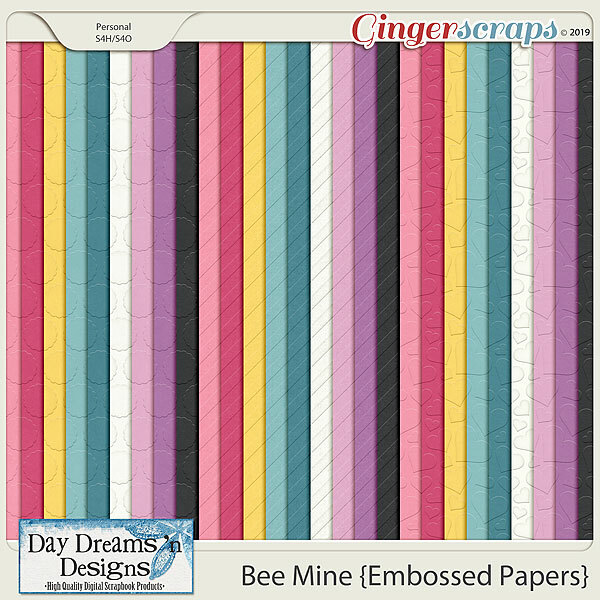 This playful, candy-colored kit is full of lovely honeybees, flowers, and hearts galore. It's perfect for making custom photo cards and Valentine's Day layouts alike. Trying to feel the love year-round? Bee Mine would also be great for birthday parties, saving the bees, or even just making a special layout just because. Love in in the air; won't you Bee Mine? Note: this it the embossed paper pack only, see the bundle for the complete collection. ** Please note this is a digital pack or kit; you will not receive any physical product. Please refer to the list of items above for a detailed list of what is included. For kits and bundles, several elements are included in multiple colors and are included in the total element count. Some sample layouts may contain items that don't come in the kit such as masks, wordart, elements, etc or are created using techniques by the layout artist. Please refer to the list and preview for the items included in the kit/pack. All files are created at 300 dpi for high quality printing. Papers are 12x12 inches. Elements and alphas are saved as png’s with transparent background.